I plan to use this as a cover for a future doujinshi, but I'm kind of pleased with how it looks so far and wanted to share. This file is large but please take the time to view 100% as compression does weird things to the lines and colors. Beautifully rendered and the detail is exquisite. Damn this is absolutely sublime. Best drawing I have ever seen of Sesshomaru and easily my new favorite. I love the detail. And the lack of outlines for the sword, fur and hair, the clean shading, and line work is absolutely brilliant. Bravo! Is amazing the detail, the vibe and his expresion... Wah! omg!! i love this!!! i love the rawness of this drawing. 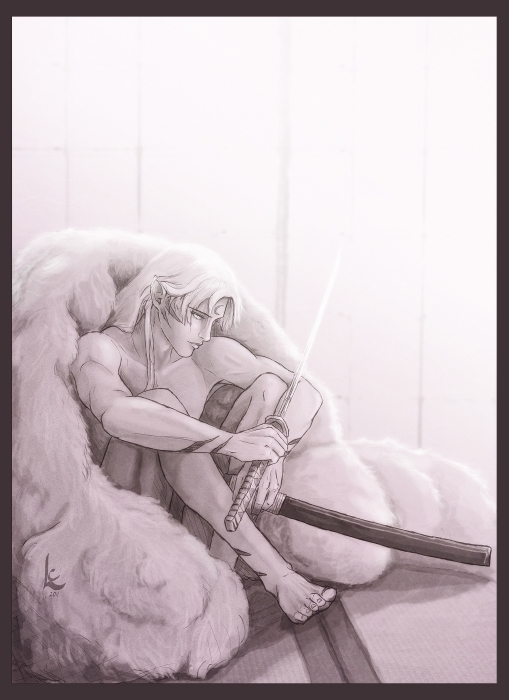 and the more life-likeness to Sesshomaru in this!!! Beautiful !! You give my beautiful Sesshomaru such a deep feeling. Truly touched my heart. Masterfully done. Must read the doujinshi! Fantastic! this is one of the most beautiful image I have seen of Sesshomaru. oh, I haven't comment on it. This is beautiful, I love the lightling, the soft look, yet the strong lines of the muscles. Hmm... my bad, it's beyond my vocabulary to describe how amazing and original it is.